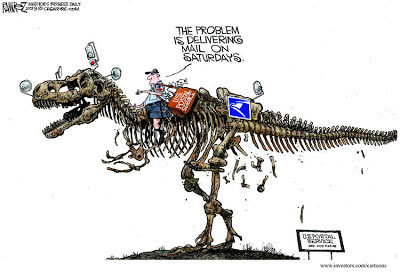 I really don't want to be one to pile on the Post Office. I know some people that work for the Post Office, and the ones I know are good people. And, at the Post Offices nearest where I work -- the one in downtown Columbus and the one just across the river in Phenix City -- the people there seem to be good folks. Of course, those have jobs where they deal with the public on a regular basis, so you'd think they'd be good at that kind of stuff. The ones I encounter are. However, the people that I know well, that work the grunt positions behind the scenes, tell the story you'd expect. It's a government bureaucracy that fails to reward good work and fails to punish bad work. Everybody gets a participation trophy. Now, these aren't people telling stories of how they, themselves, were passed over for promotion or recognition. Rather, they speak of others with whom they work that do great work, but are overlooked. They also speak of the stereotypical lazy government worker that others have to cover for, not to keep the other worker out of trouble, but so that Jane and John Public gets their mail. I suppose they could let the job go undone, but they aren't that kind of person. They care about their job, and care that the customer get the best service possible. Only, it's not always possible. Mail gets delivered late, workers work overtime, all because the system won't get rid of sorry people. Add that to the typical government mindset that the job doesn't matter as long as all the forms are filled out, and you have a very inefficient system. I don't think what we have is what Benjamin Franklin envisioned.